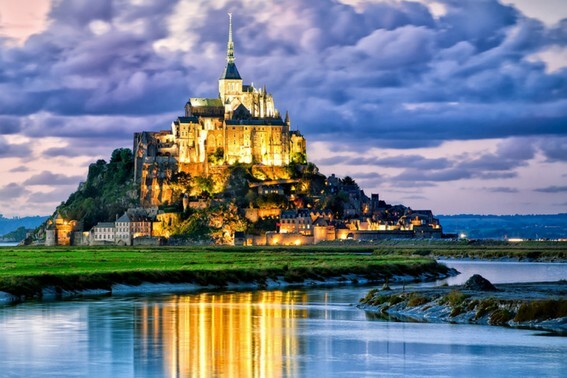 Mont St. Michel appears like a mirage when visitors first lay eyes on it, looking as if it is floating off the coast between the Normandy and Brittany regions of France. Depending on the bay tides, it is sometimes completely surrounded by water, while other times it appears shrouded in fog, looking other worldly. No matter when you make it to this place, it will fuel your imagination and feed your soul. It has been an inspiring center of pilgrimage for centuries after all. “It’s Far Far Away from Shrek!” My 11-year-old son exclaimed as we departed the shuttle which deposited us on the footbridge to the island. “No, I heard this place inspired the Sleeping Beauty castle at Disneyland,” my daughter countered. Scanning the visible ramparts and walls as we walked to Mont St. Michel’s magnificent front gate, it was easy to see why the kids’ minds would immediately go to familiar stories about lords and ladies, knights, fair maidens, and royal subjects. Perched at the top of this wonder was not a royal castle though, it was a seemingly gravity defying Gothic-style Benedictine abbey, and we were about to make one heck of a calorie burning, stair-filled climb to see it. As it turns out, my kids weren’t totally off base when they associated royalty with Mont St. Michel. Founded in the eighth century, the abbey is dedicated to the archangel St Michael, who it turns out is the patron saint of many French kings, making this a favored stop among that set of folks. The inspiration for constructing this marvel came in a vision during which the archangel appeared to Archbishop Aubert of Avranches in 708. 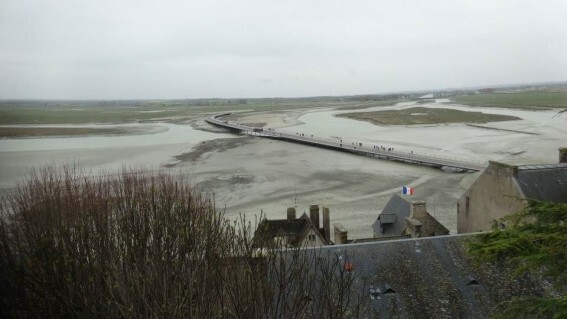 But royals are not the only segment of the population known to show up at Mont St. Michel. Early pilgrims risked their lives crossing the silty flats near the island while the tide was out, encountering quicksand and unexpected tide changes. Today it’s a United Nations Educational, Scientific, and Cultural Organization (UNESCO) World Heritage Site, giving it a designation of having special cultural or physical significance. Fewer than fifty people are full-time inhabitants of the island village now, an experience that may feel desolate at times when the tide cuts the place off from mainland France or depending on how you look at it, provide a welcome break given how often a clear passage brings a traffic jam of tourists to the tight and winding village streets. While the kids thought that being close to quicksand was pretty cool —it is quicksand or molten lava that seem to be the imaginative danger element of every playground adventure after all — and some visitors still choose to follow in the footsteps of the early pilgrims when getting themselves to the island, I was grateful for the availability of the less risky footbridge over the tidal causeway. To get there, travelers can hop on a shuttle bus or simply walk in from a newly constructed visitor’s center a mile and a half away. The route winds through a charming area of small inns, restaurants, and shopping experiences with pastoral backdrops of grazing sheep and the island floating on the horizon behind them. As we approached the ancient walls intended to guard Mont St. Michel from intruders it was impossible not to marvel in the challenges of constructing this place. There were no modern conveniences or machinery to help get materials across the bay; granite was ferried over and hiked up the hill. We explained this to the kids and were amused by the disbelief that stretched across their faces. This would be a recurring conversation as more and more amazing architectural feats were revealed to us. 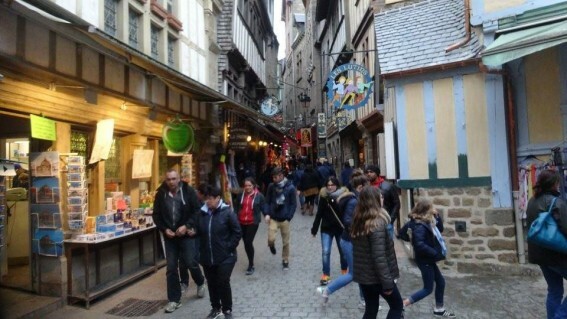 Inside the walls, the Grand Rue (the village’s main street) twists and squeezes through landmarks and past businesses. 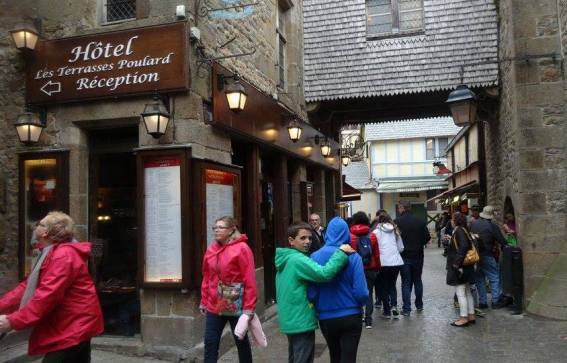 Mont St. Michel is a pedestrian zone and that’s a very good thing as we worked through multiple spots clogged by human traffic jams while traversing past souvenir shops, small eateries, snack bars, hotels, and museums. A promise to visit the ice cream shop when we returned from the top of the place was an excellent motivator to keep both kids engaged in the climb. The streets open up as you move upwards; there are simply fewer pedestrians in the higher areas of the village. We stopped briefly in the 15th century parish church dedicated to St. Pierre before continuing on. The parish cemetery and bell tower were the next landmarks we encountered. The Grand Rue ends at the Grand Degré, a staircase of 350 steps leading up to the Abbey of Mont St. Michel. The headaches of building such a structure became the hot topic of conversation once again at the sight of what looked to be a pulley system on the side of the abbey. We would learn later that it was part of giant tread-wheel which six workers powered to haul two-ton loads of stones and supplies from the landing below. It was used until the 19th century. Both kids agreed that while this system was impressive and likely helpful, getting materials up to it still had to have been quite a feat. “I’m pretty sure someone was hurt in the process!” my daughter insisted. Before that though we made our way through the impressive church more than 500 feet above the English Channel. 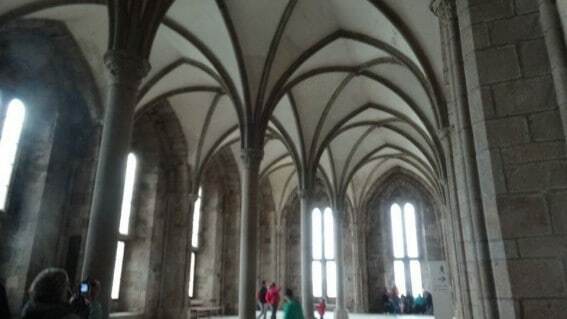 We walked through exquisite cloisters, checked out Romanesque foundations and saw the hall where the monks ate in sober silence. In the Salle des Chevaliers (the Knights’ Hall), the noble knights conjured up earlier by my children’s imaginations made their reentry into our day. We were in the room where they were received after all. There were so many sights, so much historic splendor to take in. Interested in expanding on this visit to France? Check out our Road School Guide: How to Teach your Kids about D-Day while Visiting France. 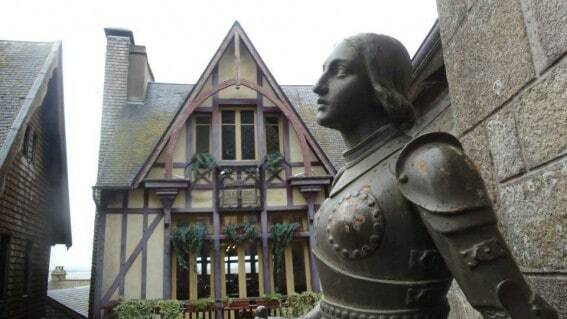 Looking for more kid-friendly places in France? Check out 12 Things to Do with Kids in Montpellier.